Visit the BMDCA site to find information specific to the breed including the official Bernese Mountain Dog Breed Standard, Draft Test Regulations, information on other Bernese Mountain Dog clubs, tips on purchasing a Berner, The Berner-Garde Health Data Base, and more. 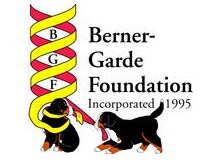 The Berner-Garde Foundation was established to collect, maintain, and disseminate information about genetic diseases observed in the Bernese Mountain Dog. The BGF is comprised of a voluntary Board of Directors, several committees and, at its core, a computerized database. The database contains information which has been compiled over many years from voluntary submissions of data from owners and from other public sources of information, including the Orthopedic Foundation for Animals(OFA) and the Canine Eye Registration Foundation(CERF). The information in the BGF database is now available online to owners, breeders, veterinarians, and researchers who are working to reduce genetic disease in the Bernese Mountain Dog. Click on the bottom menu item (left) to access the database. In addition to maintaining the database, the Berner-Garde Foundation supports research studies aimed at reducing the health problems found in Bernese Mountain Dogs. Research proposals are approved on a case-by-case basis by the Board of Directors. 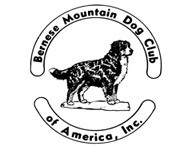 Probably the single most valuable resource on the web regarding Bernese Mountain Dogs can be found at the Bernese Mountain Dog Home Page. There is information on rescue, determining if the breed is right for you, acquiring a puppy, a photo gallery, a signup page for the Berner-L, a very active mailing list for the breed, and more. We are a group of dedicated Berner owners and lovers, who seek to provide some financial assistance to owners of purebred Bernese Mountain Dogs who find themselves in need of a little help when their dogs are accidentally injured or develop catastrophic medical conditions. Visit the sites of the AKC Show Superintendants to obtain show dates, entry information, catalog and results. 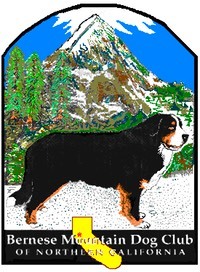 The Bernese Mountain Dog Club of Northern California presents these links purely as an informational service to our readers. The links do not imply approval or endorsement of any link site or its content.